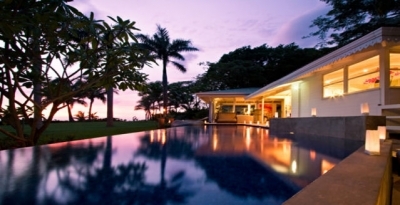 Diosa del Mar is located in a small and quiet beach village and is totally private. Diosa del Mar is a dramatic vision at night, as seen from the edge of the 60 foot luxury infinity edge pool. A tropical garden of some 10 740 square feet also forms part of the property at the end of which sits the beautiful beach. The homeowners, world renowned artists, created the embodiment of tropical opulence, and complement the amazing views of the Pacific Ocean, and the surfing beach Playa Negra. This surfing famous spot (Playa Negra) is just a five minute drive from the villa. Diosa del Mar is a luxury house "on the water" as 90% of the rooms have a sea view. The villa has five bedrooms, four bathrooms, a living room, dining room, kitchen, a 1 000 square metre plot, parking, and infinity swimming pool. The master suite has a queen sized bed with wood tub and shower, is air conditioned, has ceiling fan, and a safe in the bedroom. The second bedroom has a queen sized bed, shower, air conditioning and a ceiling fan. The third bedroom has a queen sized bed, shower, air conditioning and a ceiling fan. The fourth bedroom has a queen sized bed, a shared shower, air conditioning, and a ceiling fan. The fifth bedroom has two twin sized beds, shared shower, air conditioning, and a ceiling fan. Onsite staff includes a housekeeper (daily, four hours), villa manager and gardener.